Posted on July 26, 2016 at 10:29 am. Our inaugural Decelerator Retreat in June was an awesome success. Dr. Don de Guerre, Concordia University professor in Montreal, joined Alicia Pace MA and Dan Seguin MA to lead the five-day retreat that encouraged professionals to slow down, rebalance and align inner intentions with outer realities. Dr. de Guerre reflects on his experience of this programming pilot that will be offered again in 2017. I’m a professor at Concordia University in Montreal and I teach Human Systems Intervention (HSI), which is easier to describe by saying what it’s not: it’s not community or organizational development, not personal development or social change. HSI is all of those things. 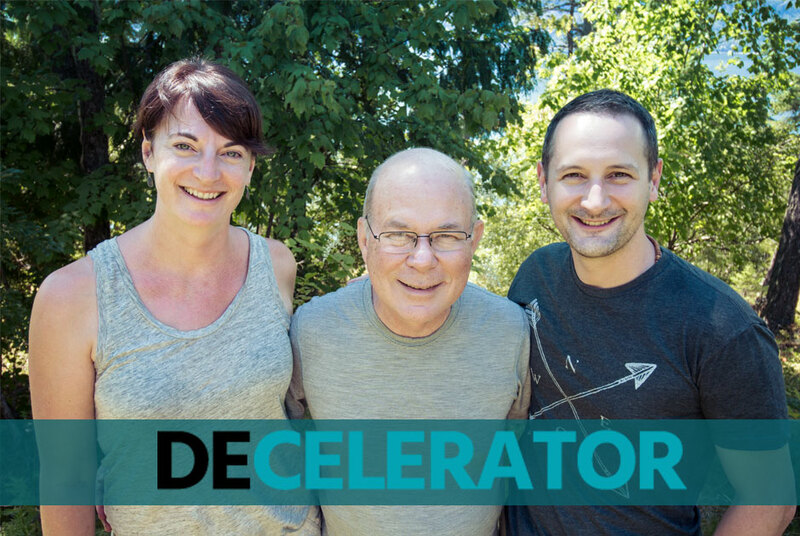 Decelerator proved to be an example of the positive forces I see in the world today. It was a joining, a collaboration of Yasodhara Yoga and HSI, a looking for new partners in new ways that combine strengths. It offered a focus on positive processes as opposed to problem-solving processes. Decelerator was a manifestation in how consciousness is shifting globally. The world is in crisis, but at the same time there is something emerging that is healthy and healing. I sense it, others are saying it, and the Ashram is doing it. Each of the participants is in some way spending their life creating a better world. They went really deep, really fast. When the three of us weren’t leading, we participated. I too experienced self-healing and regeneration. Decelerator helped me clarify something new I want to take on and leave as a legacy. That’s why Decelerator is important – it helped us all reconnect with ourselves and understand how to use our gifts in the world. I think Decelerator and the Ashram are models that play similar roles in unique and different ways. Together, they help people become more active in their home lives – to be more whole, more connected, to handle life from the Light rather than from the dark. They give tools and training to help people grow and develop. The Ashram offers an experience of a community that is self-organizing, generative, expanding and searching for new ideas and new things to do. I admire that. If I may be so bold, I say this is the time to find others like us, to build networks, connect and build on that positive force that is here and growing. I truly enjoyed my experience here at Yasodhara Ashram. In this year’s Decelerator, everyone got more than they expected and said so repeatedly. That’s inspired us to evolve Decelerator and offer it again next year. Want to know about the 2017 Decelerator? sounds like an amazing program and i wish i could have been there with you! congratulations on this innovative offering and collaboration.